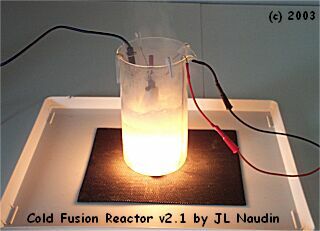 The Cold Fusion Reactor ( CFR v2.1 ) is fully based on the work of the researchers Tadahiko MIZUNO and Tadayoshi OHMORI from the Hokkaido University in Japan. 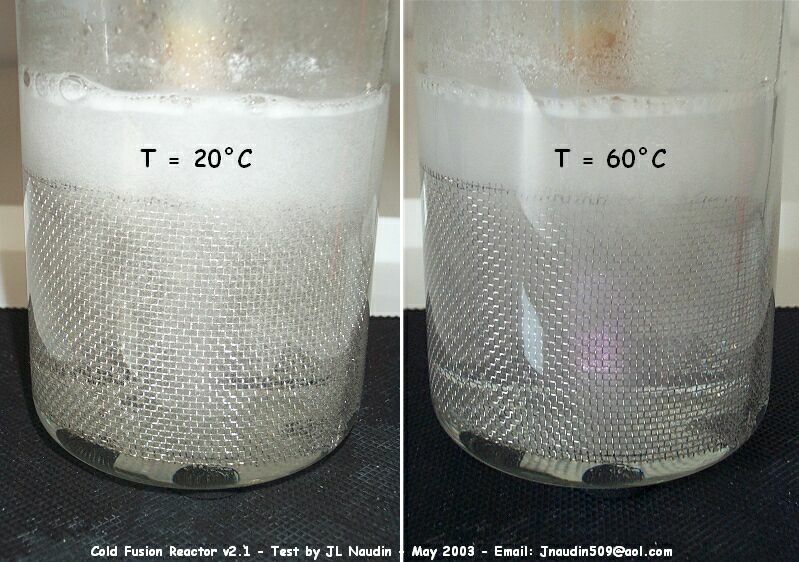 The Cold Fusion Reactor v2.1 is composed of a 1000 mL borosilicate glass filled with a 600 mL of demineralized water and 16.6 g of Potassium Carbonate ( K2CO3 ), the electrolyte solution used is 0.2 molar ( 0.2 M, ). 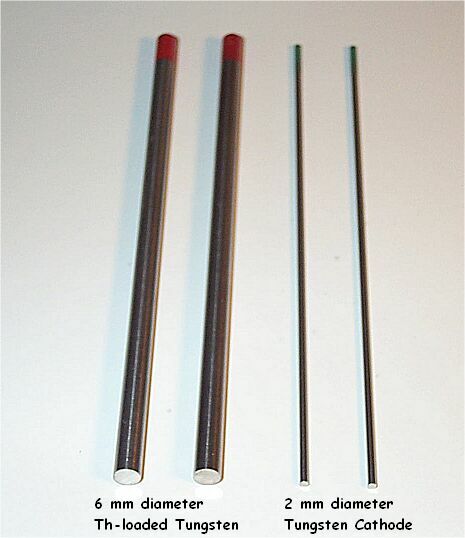 The Cathode used is a tungsten rod ( Th-loaded WT20 with ThO2: 1.70-2.20% ) 6 mm diameter and 45 mm length from tungsten TIG electrodes (WT20) commonly used forTIG and Plasma welding. 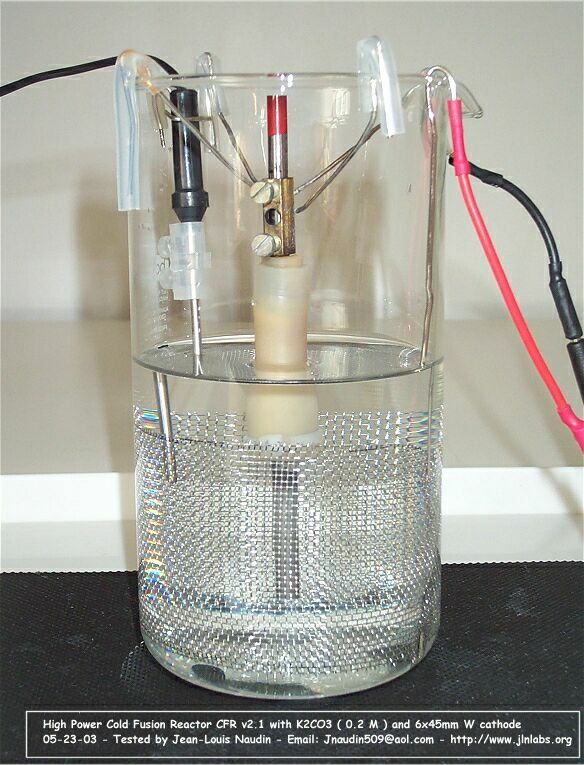 The W Cathode is fully surrounded by the Anode. 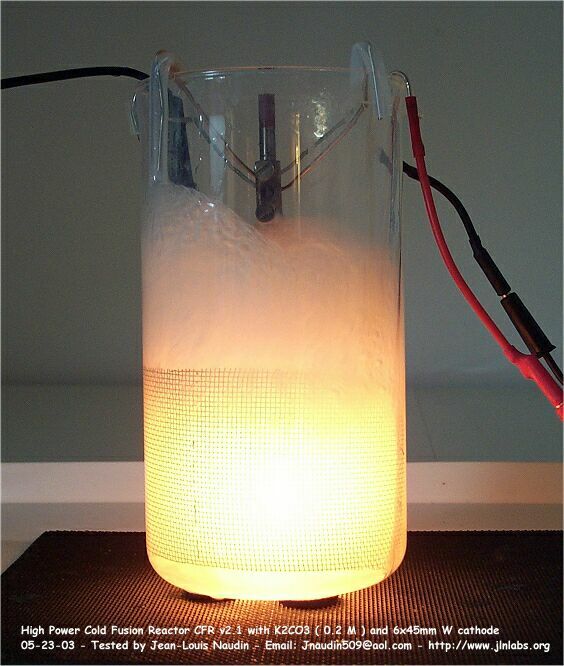 The Anode used is composed of cylindrical stainless steel mesh ( a grid ) maintained with a stainless steel shaft. 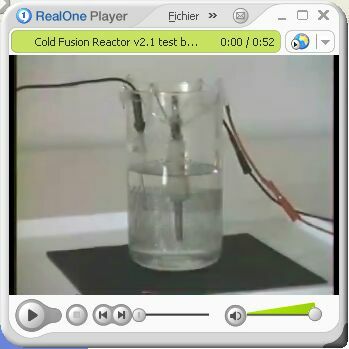 All the wires connections are made with a 1.5 mm2 copper flexible wire gained with silicon. 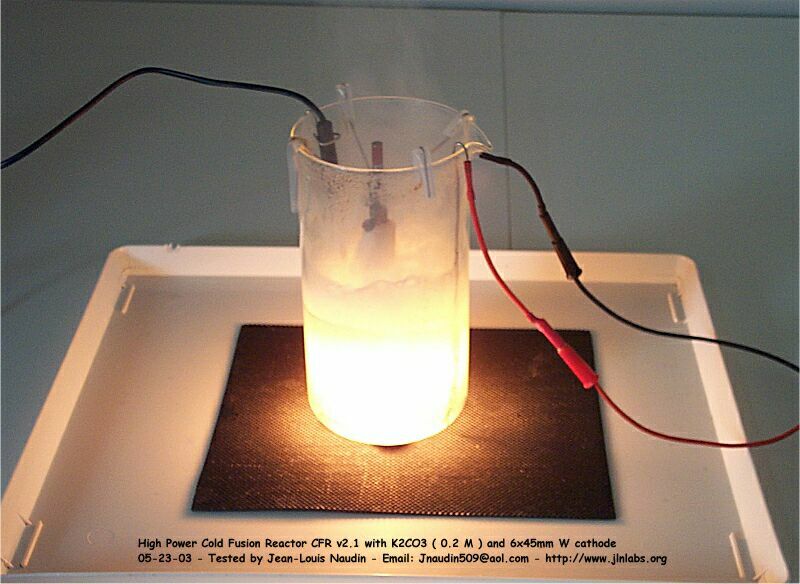 The CFR v2.1 is powered with a DC voltage through a bridge rectifier connected through an adjustable isolation transformer to the 220V AC power grid line. The voltage input has been measured with a digital oscilloscope Fluke 123 with a Shielded Test Lead STL 120 ( 1:1, 1 Mohms/225 pF ). 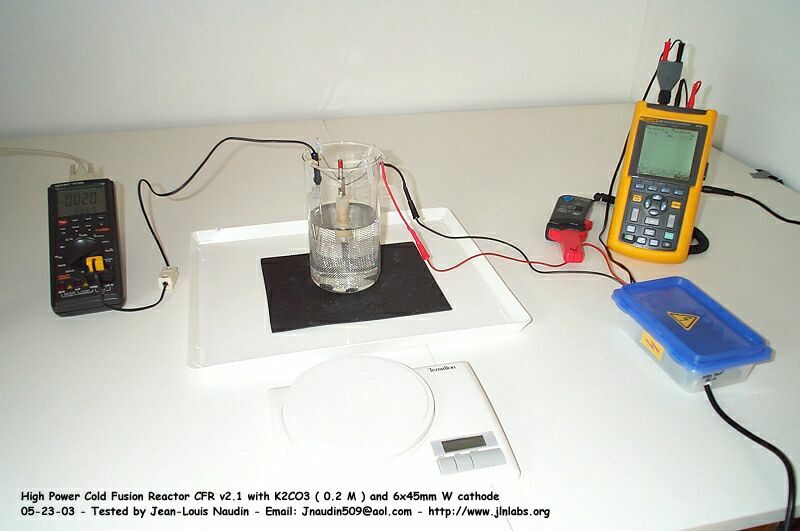 The current input has been measured with a current clamp CIE Model CA-60A ( Accuracy DC Amps ±1.5%, AC Amps±2% (40Hz-2kHz), AC Amps±4%(2kHz-10kHz), AC Amps±6%(10kHz-20kHz) ). The temperature has been measured with a type "K" temp probe ( NiCrNi ) connected on a VC506 digital multimeter ( -20°C to +1200 °C with an accuracy of +/- 3% ). 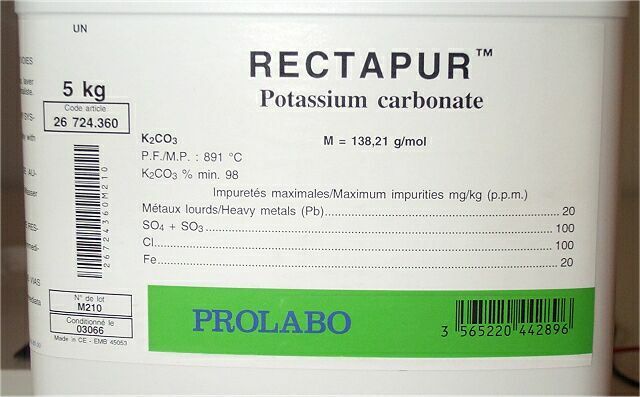 ( see the photo above ). 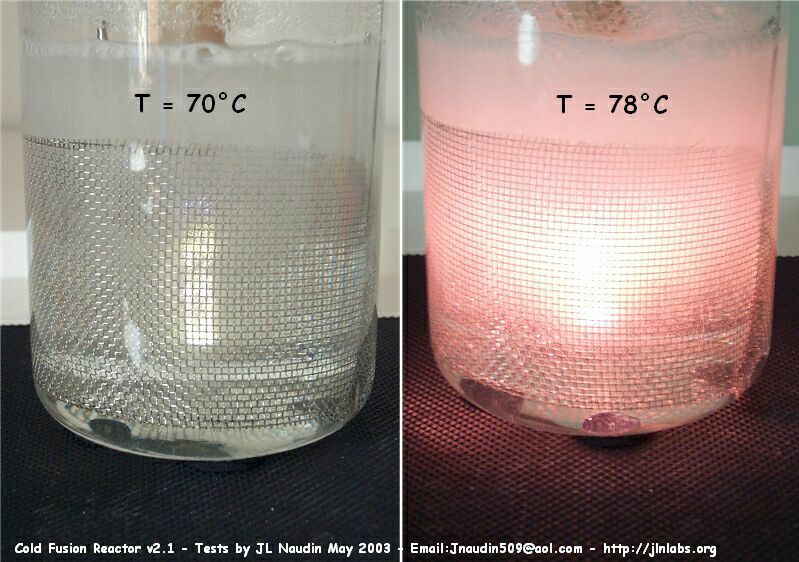 I have conducted some interesting observations about the plasma ignition sequence Vs the temperature of the K2CO3 solution. 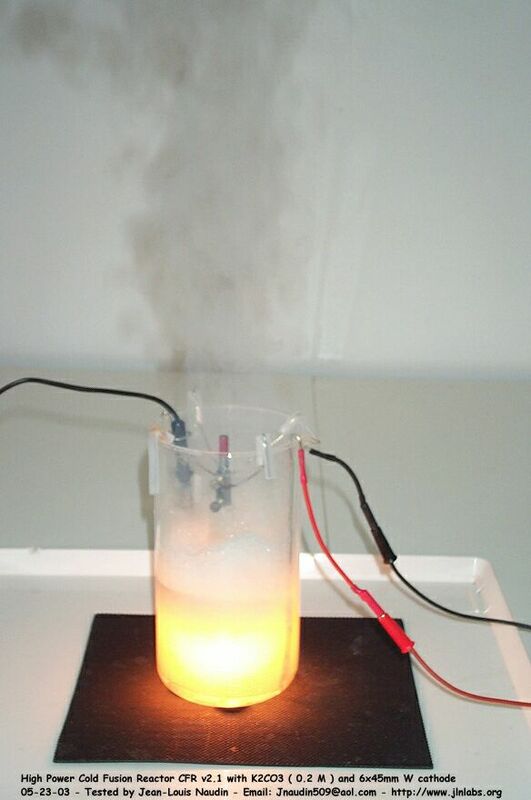 1) The temperature of the K2CO3 solution in the CFR has been set initially to 81°C. 2) The weight of the CFR has been measured initially, it was 1020 g.
3) The power supply has been switched on continuously and the Voltage/Current datas has been recorded in the Fluke 123 digital oscilloscope used as a data logger, up to a temperature of 98°C. 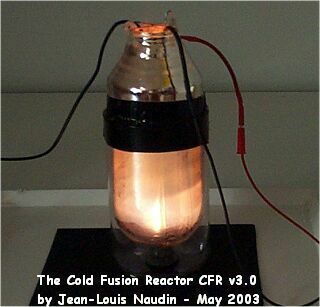 The run time of the CFR has been 34.6 seconds.